Pressing my cheeks on the tip of the window ledge, I fix my gaze on the scene unfolding beyond. 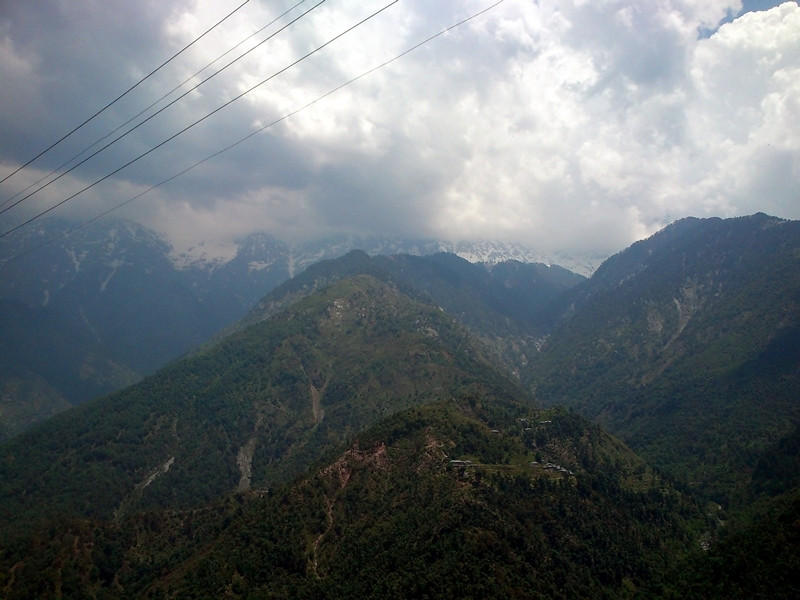 I take a deep breath in, as the mighty Himalayan Dhauladhar range fills the splayed cup of my snooping eyes. The fresh air, crisply swirling from the infinite horizon fills my lungs and refreshes my senses. The city is far behind me. And so is the metropolitan noise, the chatter, the concrete and the chaos. I am snaking my way through the twists and turns, driving up sea-level, from the plains of Kangra to the Tibetan town of Dharamsala, about 300 miles north-west of Delhi. Our very own Little Lhasa, a chunk of Tibetan heart in India. 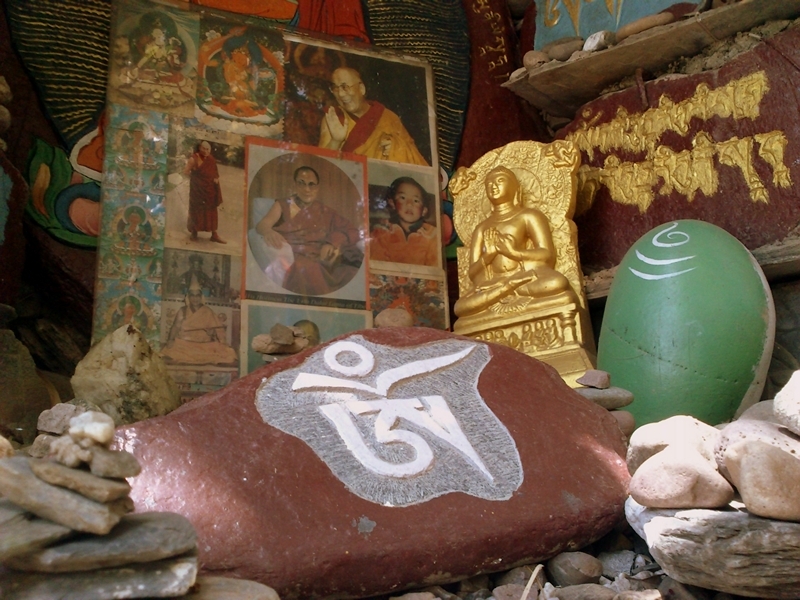 Home to thousands and millions of Tibetans led by the 54-year-old politico-spiritual leader and monk named Tenzin Gyatso (or the 14th Dalai Lama, winner of the 1989 Nobel Peace Prize), setting foot in Dharamsala is like setting foot in peace, well almost. A little further up is McCleodGanj, location of the Dalai Lama's modest house, a suburban town perched high at 6000 ft. where Tibetan refugees have settled in the following years. Peace designs the air of this spiritual town that sprays down from the brawny Himalayan foothills, soaring towards the skies. 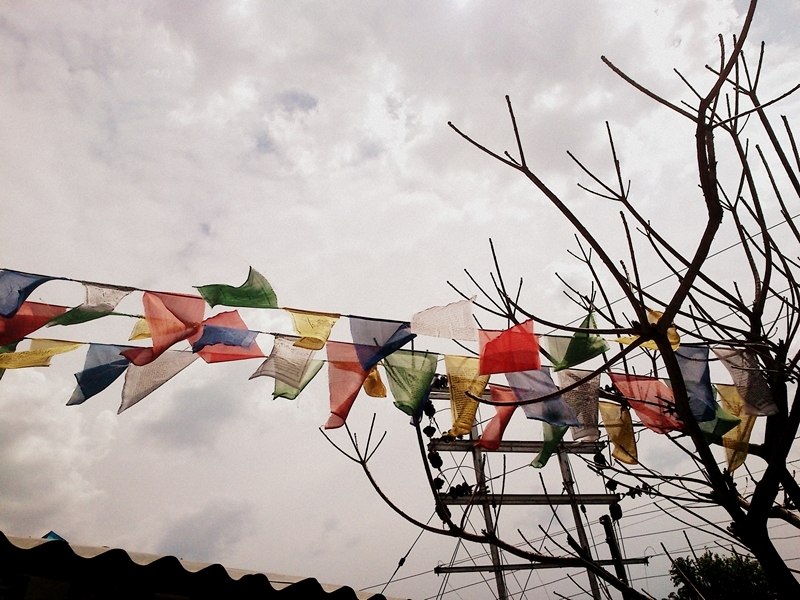 The winds cause the symbolic Buddhist flags hanging from the trees, houses and temples to flutter. With it flutters the delight in my heart. Wandering the narrow sloping streets, I can’t escape this sense of unruffled tranquillity following behind me, everywhere. Here, life is peaceful and quiet, revolving around people engaged in building a life for themselves and practising their religion. I can only attempt to experience that peace. The spiralling stupas of the Buddhist monasteries sparkle aurally like a meditating yogi deep in his cognizant slumber. Bells toll from a series of prayer wheels, placed neatly in a row encircling the circumambulatory path, that the devout spin to send their prayers in the Universe. 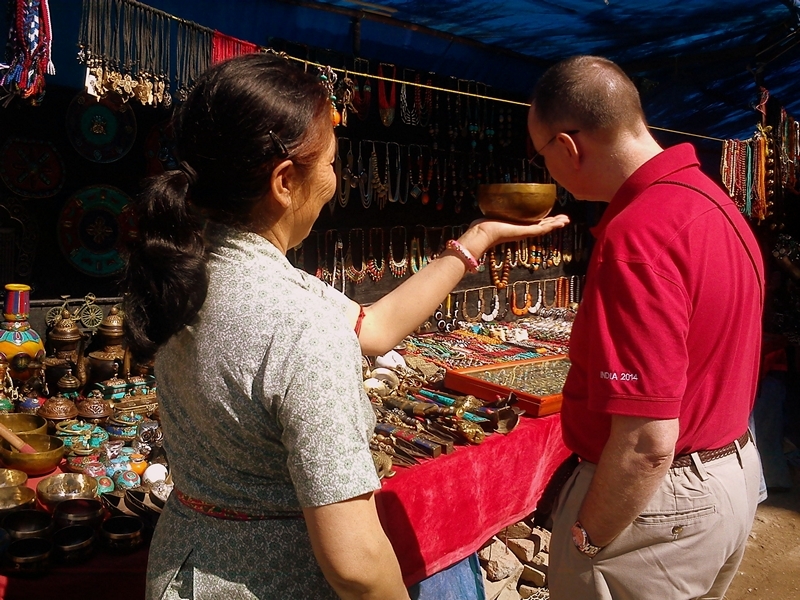 Tibetan men in fedora caps, thick rimmed glasses and women in plaited braid / ponytails wearing wraparound pinafores sell their local wares with a cheerful smile in the flea shack stalls that line the streets of the town. Red robed monks, serene looking with a sense of fulfilment unto themselves, with clean shaven heads make long strides towards their intended destination. In their hands, they carry prayer beads deftly rolling through their fingers; their lips murmuring devotional mantras in His glory and grace. While this peace, woven intrinsically into the fabric of the holy town is inescapable, what is also obvious and connects me to it, paradoxically is the smell of conflict that floats in the air like heady incense. 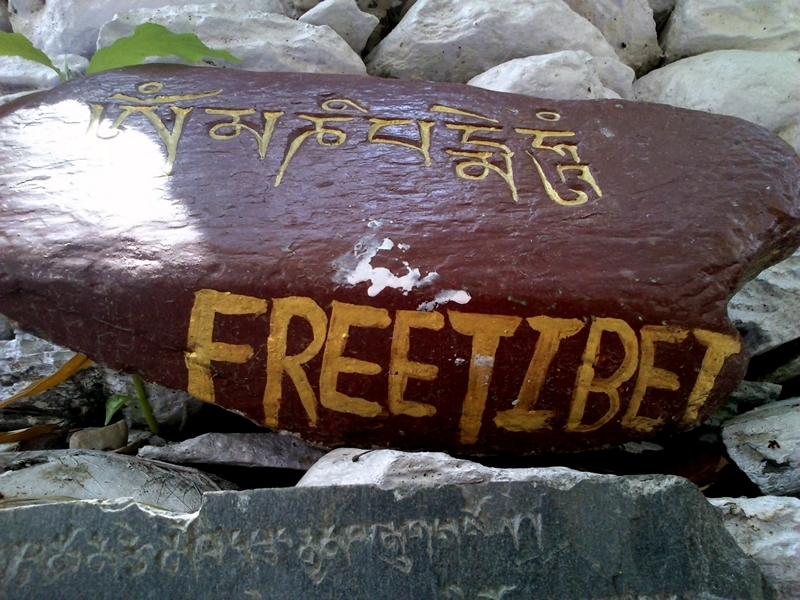 ‘Free Tibet’ is a robust voice that speaks eloquently cutting across the serenely photographic milieu spread otherwise. I detest conflicts. They are frightening. But as much as I abhor it, its dark colours of bitterness cannot be excluded from this painting of life. It’s only by wading through the muddy waters of conflict and unrest that blooms the flower of peace and love. That we get a glimpse of the innocence of love which exists in brotherhood. That the past is left behind and a new bond is formed. That we can perceive a pattern in the Universe even amid the chaos. The city of Dharamshala, is the #madeofgreat city which shows me how. 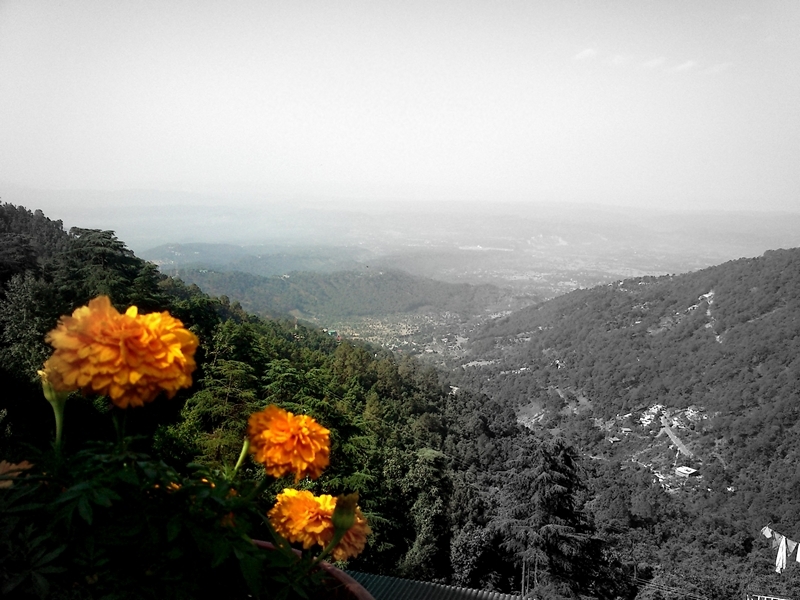 Great to read your new post on Dharamsala, Awesome photos. Such a lovely peaceful post, thank you. I visited McLeodganj in 2008 and loved it...though my friends tell me it is overcrowded and too commercialized to cater to the 'touristy' crowds!! Your friends are right, Sushmitha... but to an extent. Yes, it can come across as crowded but the beauty lies in finding the right places for ourselves. Dharamshala is one place that offers that. Thanks, Ani .. hope you get to go there soon! I have one of those resonance vessels, but the sound is not as prominent as when they do it. Such a remarkable post, Arti. Made me feel like I was there! I could almost smell the cleaner air and feel an energy flowing through me. This is a city I have always wanted to visit, and your post has made that desire even stronger. I VISITED IN JULY ,WONDERFUL PLACE AND WONDERFUL PEOPLE,A MUST VISIT! It's on my bucket list. Such a peaceful and wonderful place to explore! No matter where you are, you find tranquility and beauty, Arti. It’s like photographing. In this paradoxical world, when you look at wider view, there are both right and wrong, but when you focus on details where your instinct guides, there’s beauty and peace. I’d like to believe truth germinates even amid the chaos. I’ve been inspired by Dalai Lama like many other people. By the way, I especially like the photo of the fluttering soft-colored cloths. Time flies and this year is going to end. I remember the time when you sent me a comment around Mother’s Day. I’m always amazed with your pure heart as well as your talent and interested in how your parents brought you up. Hope all your family are well. Wish you a heart-warming holiday season and a prosperous New Year. In most of life there is both peace and conflict. To live in a way that promotes peace is both challenginng and desireable. Your photos are wonderful, Arti. Through you lens I visit places I may never see otherwise. Wonderful photos. Dharamshala is such a special place. This is a place I would definitely love to go to someday. Thanks for the beautiful pics and narration.